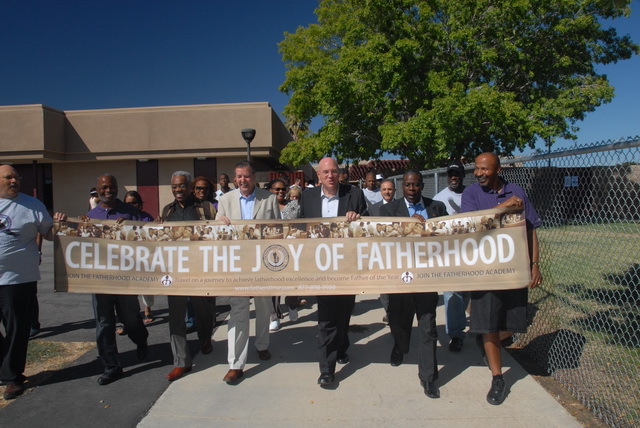 Palmdale, California – Today was the inaugural Fatherhood Conference, hosted at Joshua Hills Elementary School in Palmdale, California. Presented by United Christian Fellowship church, the event was held to coincide with the 600-city Million Father March, a program managed by the Black Star Project, USA. Several dignitaries were on hand including Palmdale’s mayor James Ledford. The day’s event began with a march from Joshua Hills Elementary. Originally slated to wind up at United Christian Fellowship’s new church, the plan was changed and the route shortened to circle the park next to the school. Once the marchers returned to the school, they were led into the auditorium. Bishop Edwin J. Derensbourg, senior pastor of United Christian Fellowship, opened the program in prayer. On the program were keynote speakers ranging from Mayor Ledford to Bishop Henry Hearns (his representative addressed the attendees because Bishop Hearns had a prior engagement) to 36th Assembly District candidate Linda Jones. A 10-guest panel of experts discussed ten important areas in a father’s life. I had been happily shooting away, capturing some great images along the way. Jogging backwards while snapping the shutter as the marchers embarked on their walk, jumping up onto and down from tables to get those bird’s-eye views, setting up a group shot of the dignitaries in the greenroom, being front and center when a proclamation was read and presented; I was in my element. And that’s when I had a revelation. As I took a few wide-angle shots, I realized how important this event was. I noticed only two reporters in the room – local ones at that – and I knew none of them had the shots I had taken to mark this historic occasion. I thought about writing a feature article about the conference but realized I was in photographer mode instead of photojournalist mode; I did not have my tape recorder with me to conduct interviews, nor did I have my pen and pad to identify the speakers and panelists. I had some good shots, but no story to go with them. When I edited the images afterward, I could not remember all of the names of the VIPs nor the all of the panelists. It is said that you should not be afraid to ask for help. Well, this was one time where I could have used some help. This is one time where collaboration with a good writer would have been a huge benefit. Our collaborative efforts would have had three times the effect; the writer would’ve had great photos to illustrate his or her article, I would’ve had a great piece to go with my images, and the Fatherhood Conference would’ve had a great story out in the media. Click the link to view photos from the Fatherhood Conference.